entertainment news | ...Prepare to Die. Elegy for a Dead World is… strange, to say the least. Developed in collaboration by Dejobaan Games (AaAaAA!!! – A Reckless Disregard for Gravity, The Wonderful End of the World) and Popcannibal (Girls Like Robots), the basic concept is to write. That’s it. There are no easter eggs, puzzles, or action. Just you and whatever ideas you can come up with. Ordinarily I’d think this is awesome, as I like to write novels, but usually what people consider to be a “game” contains some element of direct or in-direct reward for tasks completed. This is greatly lacking in Elegy, and it’s important potential buyers are aware of this. It’s all about self-fulfillment, not measurable achievement. To read the rest of this review, please click the link above to Cliqist, a game news site that covers crowdfunded games! With development for Banner Saga 2 officially announced, it’s the perfect time for a second look at the popular viking-themed tactical RPG game for the holidays. For those who have already beaten the game, there’s plenty of reasons to go back. Since its release there have been several patches that have fixed technical issues, improved performance, added new configurations (including profile saves and subtitles), a better balanced final boss fight on normal and easy mode. and modding capabilities, just to name a few. But if you haven’t played the game? You’re definitely missing out. To read the rest of this review, please click the link above to Cliqist, a game news site that covers crowdfunding games! So many games try to bank on nostalgia these days, and so many have failed or misrepresented themselves, that it’s understandable to be wary of any new title that promises you the pixelated moon and stars with a healthy helping of hype and some impressive coattail acrobatics. The question is: are Numantian Games, the Madrid based studio, doing just that? Their latest game, Lords of Xulima (don’t worry, the name threw me off too) is billed as a 2D isometric turn-based RPG that tips its plumed hat to such titles as Ultima, and Might & Magic. It also promises challenging gameplay, over a hundred hours of content, and a broad range of customization for your party of six. After over nine hours into the game, I felt I had pretty good idea of what the answer was to my question. At character creation, the player can choose to jump into things with a pre-generated set of heroes, but being the control freak that I am, I chose to generate my own team of adventurers. I found myself disappointed by the level of choice I had. Character creation consists of three simple steps: pick one of the ten classes (of which all stats and starting spells are predetermined and unchangeable), pick a deity (who provides a small bonus without there being any explanation what some of the stats even do in the game), and pick a portrait (all of which varied in quality from photo-realistic, to ugly deviantART level anatomy). When a game boasts 100 skills to choose from, I want to…you know…choose from them! Want to read the full review? Visit Cliqist.com and get the final verdict for this indie crowdfunded game! The Collection, and My Cautious Excitement For It. EDIT (7/17/13): Having finally watched this movie, I will say that I DID like it. As far as the torture genre goes, there was really only one scene I can recall with any sort of prolonged grossness, and it was camptastic. The movie has a very anti-authoritarian feel that makes me think of such 90s cult classics as Disturbing Behavior and The Faculty. BUT, I did get a few details wrong in this post. The female lead from The Collection is not the same little girl from the Collector. The new film picks up very close after where the last left off. So last Halloween, I watched The Collector for the first time. What struck me was that: A) the protagonist didn’t piss me off, B) The villain was mysterious and scary enough to take him seriously, and C) The concept of a murderer who utilized deadly and sadistic traps was pretty damn awesome. If you think some of the Collector’s style is a bit too derivative of the Saw series, let me just stop you there. First of all—Saw one-through-whatever was terrible. Second, Jigsaw never captured his victims with traps, he always knocked them out, and placed them in a deadly and controlled environment of his own making. In the first film, as some of you may know, a thief by the name of Arkin enters a rich family’s home due to circumstances forcing him to end his abstinence from crime. But things take a turn for the worst when a slasher appears to murder the entire family. Our protagonist has a choice—leave and save his own skin, or stay and help the people who treated him like dirt and who he planned to rob. In true Hero fashion, our man stays, and through his efforts, he is at least able to save the youngest of the family, a little girl named Hannah. The big twist at the end was that the Collector was not done. No. Instead of our Hero riding off into the sunset, our maniacal slasher appears to kidnap Arkin and put him in the infamous Last Survivor’s Chest. Now in the new movie, The Collection, which you can watch the trailer for below, Arkin seems surprisingly whole and well. He’s even brought in to police as a sort of “expert” on the Collector, having been one of the few to survive his attacks. I’m truly curious to see how they explain Arkin’s escape from the villain at the end of the first film. And he isn’t the only one who makes a “return”. In the Collection, Hannah makes a return as a young adult. The trailer shows her heading off to some underground rave, but—surprise surprise! The Collector is there, and with a nasty trap for the crowd. I suppose Arkin is assuming his role as protagonist again, which is fine by me. But I wonder if the charm that the original Collector had will be lost as the story enters into that scary and soulless world of franchises. It’s written by Patrick Melton and Marcus Dunstan once more, with Dunstan directing again as well, and while I try to ignore their involvement with the Saw franchise, I still fear that the new school slasher film with old school roots will become hackneyed and ridiculously commercial. 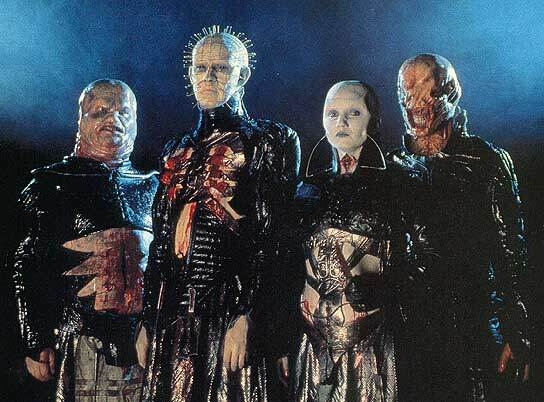 The other reason I like Hellraiser so much is for its use of live special effects. No CGI, no fast cuts, no cutting corners. Everything in Hellraiser is right there for you to see, and it is horrifically imaginative: A woman whose throat is sliced upon and held that way by wire flossed through both her cheeks; a tall and muscular being with no facial features save for twisted skin and a lipless mouth whose teeth ceaselessly chatter; a fat and disgusting creature wearing black glasses whose stomach looks like a victim of circumcision gone wrong. The deaths, while at times over the top and cheesy, were still imaginative, and the special effects did an excellent job of furthering the atmosphere of evil and extreme violence. Throughout its series, I thought Hellraiser managed to retain these qualities. Will the Collector be able to do this too? I was rather happy with the first movie, and while I’m sort of excited for the sequel, due for release in November 30th this year, I just hope that Dunstan manages to keep his original vision from escaping him. I mean, yes, he was involved with the craptascular Saw franchise of which I loathe, but he was also the co-writer of Feast, which I love to gory little bits. I haven’t seen Feast 2, so I cannot comment on that as far as quality goes. I just hope that the Collector is able to retain some integrity as the horror industry’s “sequelitis” worms its way into the picture. Halloween is right around the corner kiddies, and it’s my favorite time of year. Expect to hear me talking about spooky things more and more as the clock winds down to October 31st. I’ll probably due a full review on Silent Hill: Revelation 3D, which I’m totally stoked for. I’ll detail the reasons why later, but for now. I’m done. Steam is doing a free-to-play weekend for Saints Row the Third and I wanna know if this game is worth even half of the hype it got when it came out. By the way, Akumu Love Panic! is at some 2500 words so far! Nearly done, whoo! As for Eikasia? Uhh…wellllll….